I think I understand what you're saying, thanks. I've pretty much got it --all but the last part. I lose my way where the wedges are cut so the annual rings remain perpendicular to the flat surface. I've a pie cut piece of log that's 1/4th. of the total circumference. How are the cuts made so that the lines are (a) always straight without fanning the angle of the saw to the wood? Are the quarter-sawn Parkers a myth as per true quarter-sawn wood goes? It would seem like only one or two (tree size depending) pieces of wood that would fit your description are available - true? In the diagram, a quarter-sawn board is indicated at 9:00, if the end of the log were a clock face. You might get several more quarter-sawn boards whose ends would be arranged radially around the "clock face." Maybe at 11:00, 1:00, 3:00, 5:00, etc. The width of the board in the diagram is actually too wide (too close to the center of the log) to get more than about 4 boards from a log of that relative diameter. Maybe in a ideal world with perfectly round trees and perfectly cut wood, quarter sawn wood would have the grain running perfectly perpendicular the entire face of the board. But with the irregularity of wood, not all quartersawn wood is "perfect" for the entire piece. 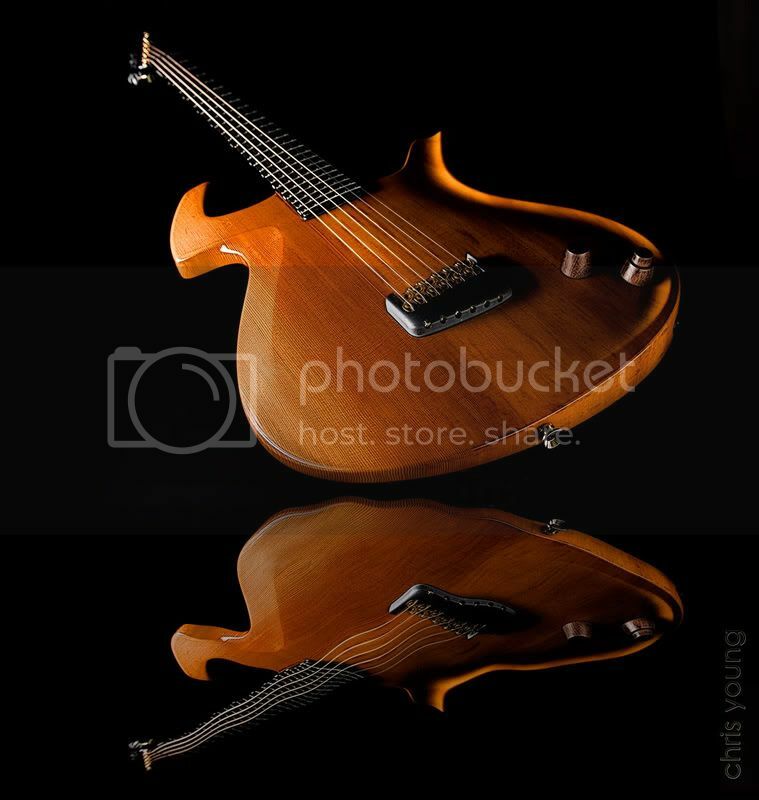 Similar to the guitar pictured above, the one I owned and sold had grain that was perpendicular through most of the body, but not the entire length. Looking at the guitar from the bottom would clearly show it. Here's a picture of quarter sawn wood. Notice that to the left of the board, the grain begins to slant just like on the quarter sawn Tulipwoods I've seen. And this is a very short piece of wood; imagine how much the grain would slant in another 12". Ultimately I'll defer to Ken Parker who advertised the Tulipwood as quarter sawn. If it was good enough to meet Ken's standard, it's good enough for me. One of the reasons that quarter sawn wood is more expensive is because there is far more waste when cutting up a log. Slab cutting yields more wood. You can see the end grain and see how perpendicular it is to the surface? That's quarter sawn! 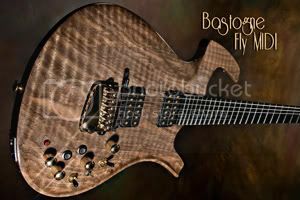 Most of these other hard woods that are used in making Flys come from sources supplying wood for solid body electric guitars. It's not necessary to use quarter sawn wood for that purpose and maybe not even as desireable because the grain isn't as interesting if it is just perfectly straight. You might find a piece here and there that are by accident but not by intention. The Fly doesn't need to get strength from using woods that are stiffer because they're quarter cut. The Fly uses CF for that. Notice how the boards marked "A" and "1" are about as perfectly quarter sawn as you'll get. And by that standard, there are only four "perfect" quarter sawn boards per tree. But all the other boards are also considered quarter sawn, though the grain curves as you get further towards the outside of the trunk. With all due respect to cy2989, you're full of cr*p; Tulipwoods are quarter sawn. P.S. And I do have an Artist too which isn't perfectly quarter sawn either. "The Parker Fly Tulipwood model will be limited to 35 instruments, each constructed of a single, solid piece of tulipwood quartersawn from large trees native to the eastern U.S. Each guitar shows light figuring running perpendicular to its wide grain, which is enhanced by a lush transparent emerald finish." Yes Mark, that's a quarter sawn piece of wood. The picture that Titus showed of his guitar is not. It either is or it isn't, there is not in-between. You can't have grain in the shape of a V and even be close. Again, I'm not sure why it is important. It doesn't affect the guitars sound (in the case of a Fly or another solid body) or durability. Still a beautiful guitar. When I got my tulipwood the music store owner had two of them. He by accident sent me the wrong one (not the one he showed me the picture of). The first one he sent was slab cut. NOT quarter sawn. When I brought it to his attention he sent me the one I had seen the picture of, so for a day or two I have both of them. I kept the #7 which is quarter sawn but only because I felt it played just slightly better. The Tulips were not all quarter sawn and obviously the Butternuts aren't either. I'm not sure what you're talking about when you say quarter-sawn Parkers. The Bronze and the Artist, which are made from mostly spruce, are quarter sawn. Yes, I know about the Bronze (at least the Cedar - I own one). What I meant by "quarter-sawn Parkers" is that the only Parker I'm aware of that made a point of using "Quarter-sawn" as a selling point was the LE Tulipwood. My research indicates a variance with the grain of this LE model, and when you suggest that the wood in the guitars is NOT quarter-sawn, well ... to the owners of said guitars, that's a serious charge! My research (may be wrong) revealed that only a few boards per tree are truly what you describe, but that the remaining wood from this particular cut is not tossed in the bin; it's used as are the premium boards. I guess it comes down to semantics, but I think once a tree is destined to be quarter-sawn, and subsequently is, most - if not all - of the boards from that tree are designated "quarter-sawn." That what I was driving at. But from a purist standpoint, I see what you're saying. Sort of like "heart of pine" cannot have a single knot, when many fine floors (and cabinetry) bear witness marks (knot holes) of this 'defect' but are still referred to as "heart pine." "With all due respect to cy2989, you're full of cr*p; Tulipwoods are quarter sawn." How many stringed instruments have you made Mark? The picture you show perfectly illustrates my point. None of those pieces of wood will have grain that runs in a V or an A shape (like Tutis' guitar) except that pie shaped piece. That's because the annual rings, in the pie shaped piece, are running parallel to the surface, not perpendicular and the rings in Titus' guitar at some point are also. Not what I would call quarter sawn. I kept the #7 which is quarter sawn but only because I felt it played just slightly better. The Tulips were not all quarter sawn and obviously the Butternuts aren't either. Just for clarification, the guitar I pictured was Mark's guitar (now mine), and is #7 of 35. The grain, when sighted along the bottom, is perfectly perpendicular to the top grain from the control-side edge over to about two-thirds of the way to the opposite edge. At this point the wood becomes figured and more slab-like in uniformity. However, you can trace the curve (like looking at the curve of the tree) and see where the wood goes from straight quarter-sawn -- through & through -- to the figured portion on the thinnest side of the Fly. I found a picture of another LE TW very similar to this one. I wished I'd saved the picture because I can't find it now! In any event, the straight grain (top and sides) is nearly identical to that in my Cedar Bronze. I'd say that's either one tricky slab cut or it is indeed quarter-sawn. So, to sum up, I believe the guitar qualifies as "quarter-sawn" even though a wood purist may not state as such, there is certainly grain in the guitar consistent with the definition of "quarter-sawn" wood. I, too, as Mark states, seriously doubt Ken Parker would advertise and sell a run of 35 guitars based on a blatant lie regarding the wood used when checking it is so easy to do. Edit: when I say "perpendicular" above, I mean at the appropriate angle to, but perfectly in line with, the top grain. Hope I have that right! Wouldn't that depend somewhat on the size of the tree, the width of its grain, and the location of the board used? If the trees used for the TW-LE were as advertised (old growth, large and with wide grain), isn't such a piece of wood certainly possible? I'm not sure why it is this important to me to get my point across other than I just feel frustrated that I can't explain this clearly enough. Take a look at this picture (sorry that my artwork is poor). Maybe a 3D image will help. When you see the annual grain forming an A or a V, it is because the grain has become parallel with the top and as the rings come through it makes that pattern. This is the very definition of slab cut. This is not quarter cut in any sense of the term. I don't care what Ken's marketing said. This is a slab cut piece of wood and you don't have to be genius luthier to know that. Anyone who knows anything about wood working knows this. This is my last attempt at this explanation. If I'm still not successful then we will just have to let this lie where it is. I enjoyed the discussion. No problem, Chris. Thanks for taking the time on the topic. I'll take some pictures when the weather's better - It's raining here and I'm such a bad photographer my pictures always do much better in natural light. My camera isn't the best (8MP samsung) but it does macro fairly well, so I'll try to post some end/top grain shots. I see your point and appreciate your effort (drawing) and input. "PS: It's all Simon's fault anyway ." LOL! I was thinking the exact same thing. Just kidding Simon.